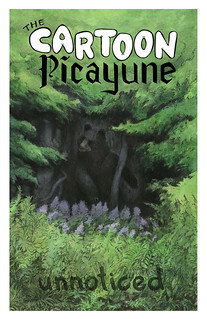 The Cartoon Picayune, the zine anthology of nonfiction comics, is coming to an end. I won’t be publishing any new issues. I’m very proud of the eight issues I’ve put out and the original journalism I’ve commissioned and created. It’s not ending for any sad reason — I just want to spend time on different things, many of which will involve comics journalism. If you subscribed, ever bought an issue, or recommended it to a friend, thank you very, very much. I will keep this site up, and will continue to sell the copies of the print issues that I have in my apartment. Buy them here. I have changed the prices to reflect availability. Sets are no longer available. I have a lot of work coming out soon, and a new project starting in 2018 that I'm pretty excited about. If you're a Cartoon Picayune fan, please keep in touch.